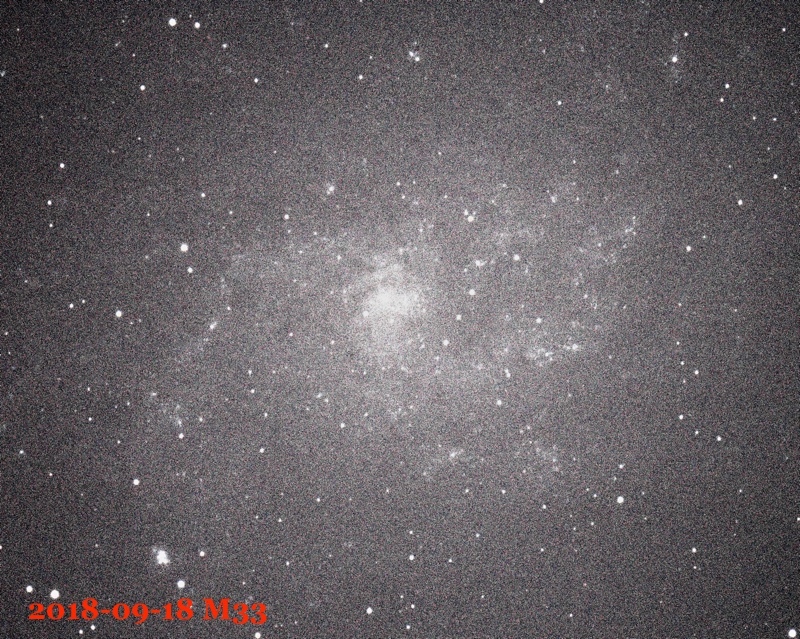 My project to photograph all of the Messier objects. I figured this would be a good way to get me out with a good combination of my stuff and help me figure out how to run the photography side of the hobby. It's a lot different than the film days. If the picture ain't there then I ain't taken it yet. I started the project 2017-07-16. At least that's when I got this web page ready to go. 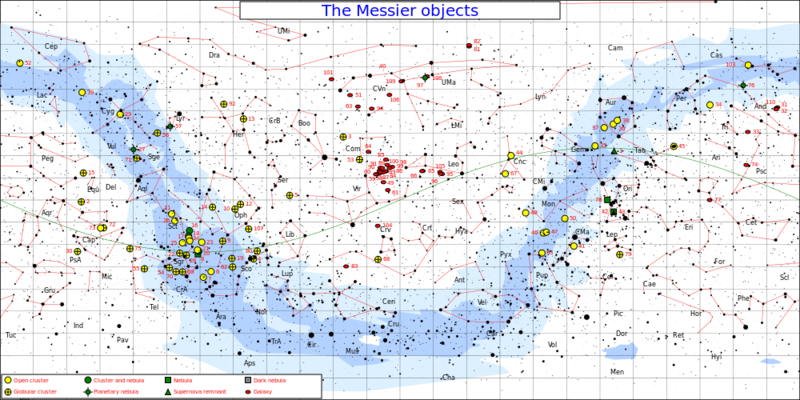 I stole the list of objects from astropixels.com. It's a really nice site. 2018-07-07: Just playing with my T6i, Edge 800, Evolution mount combo. I know I can do better than this even with the Evolution mount. I was just showing someone what they could see in their C8 vs what you can see in 20 seconds with a camera. They were impressed. It looked a lot better on the view screen. Hook 'em while they are young. 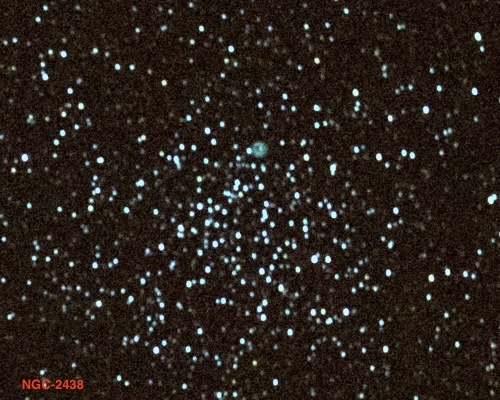 This was an exceptionally crappy picture taken by my old "Sedona" scope and mount. This not so bad one was with my Mach1GTO mount, Edge 8" and Canon T6i. 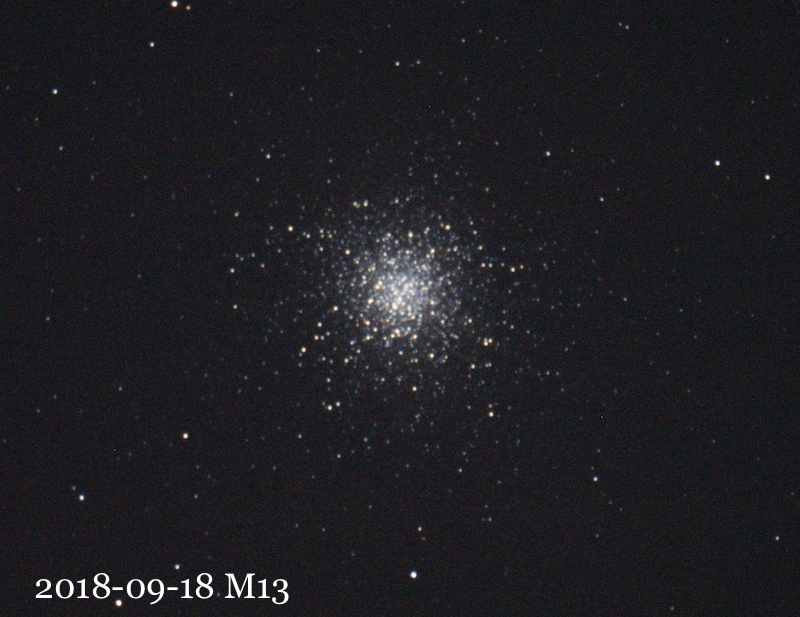 Later in the evening I took a comparison shot of M13 and Omega Centauri. The pictures are the same scale. Quite a size difference. I guess the Great Nebula in Hercules isn't quite so great. Sedona looking for Mr. Omega Centauri. 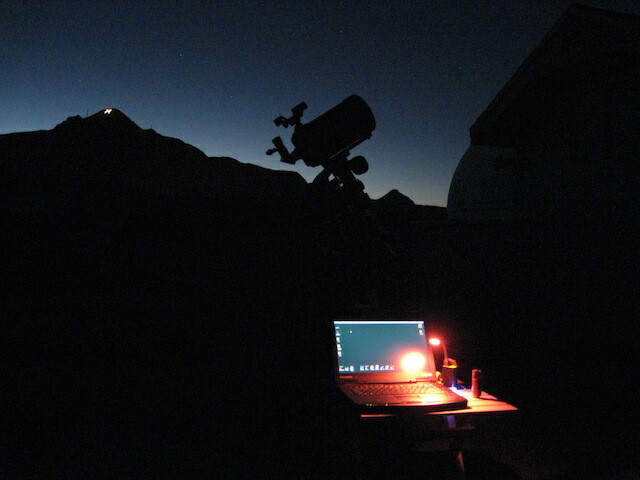 2018-07-07: Just playing around at the end of the First Saturday outreach party at the Etscorn Observatory. This was my Canon T6i on the Edge 800 on the Evolution mount. Not horrible. 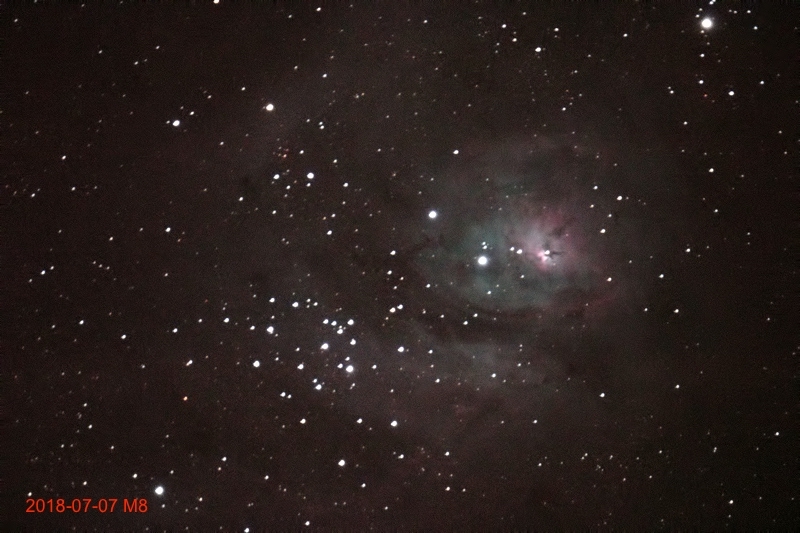 Took some quick snaps of the Lagoon and Trifid nebulas. They were horrible. So this is a 125 second exposure with a lot of Moon in the area. I was mostly just zipping around testing the Mach1GTO mount and not shooting pictures for National Geographic. A 30 second exposure with a Canon T6i, C8 Edge, and Mach1GTO mount. 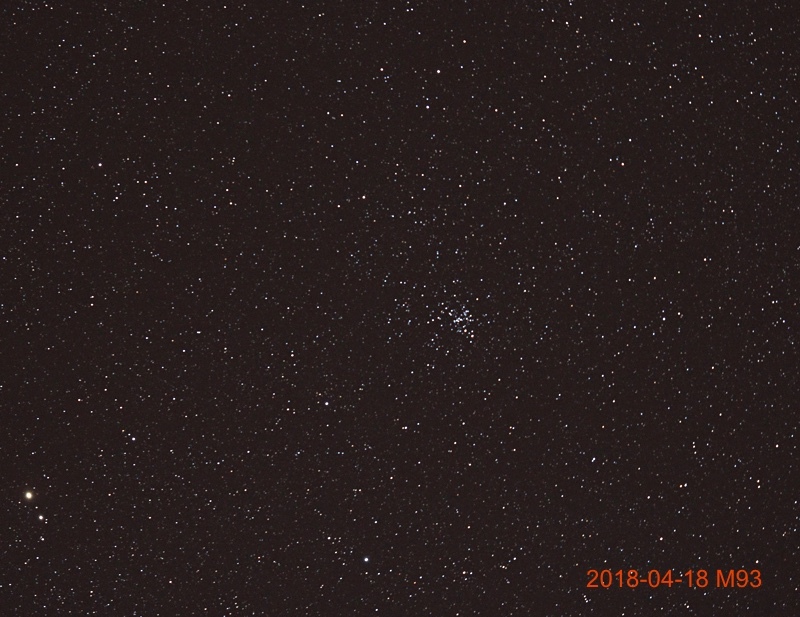 I was testing a Celestron Evolution mount with my WOZ61/T6i combination to see if the Evo mount could handle photography. 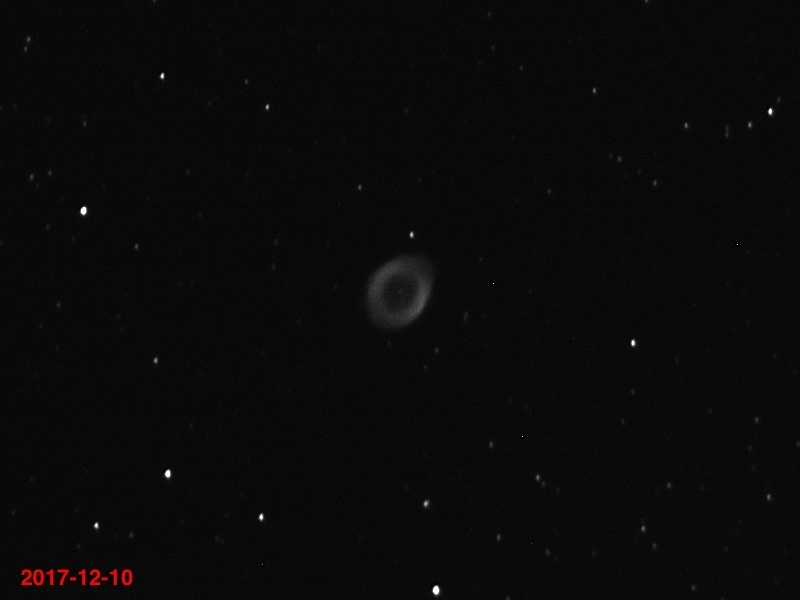 The picture is crappy, because I was testing the mount and had the ISO cranked way up. 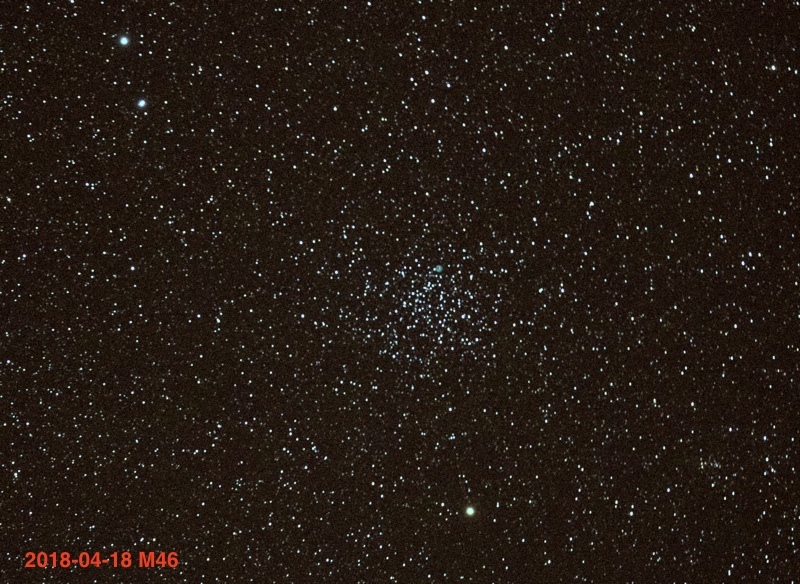 M46 has a planetary nebula, NGC-2438, not in it but in front of it a few thousand lightyears. I thought it was a flaw in the camera chip. North is roughly up in both of these pictures. 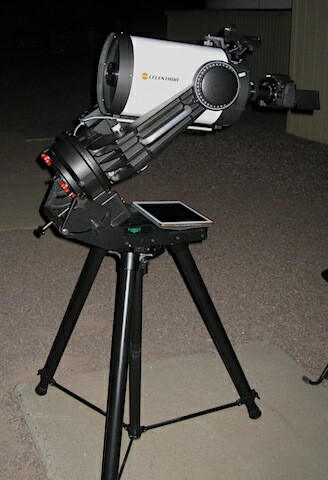 Some of the pictures were taken with this test setup to see if my Celestron Evolution mount could do it. 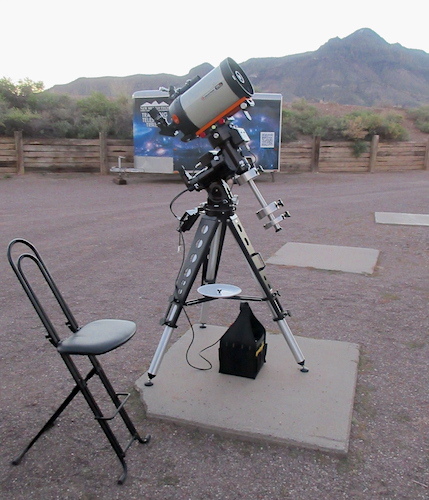 This setup was quick and easy to get going, and the go-to nature of the mount made finding the objects a breeze. That's a William Optics Zenithstar 61 scope, Flat61 field flattener, and a Canon T6i camera. 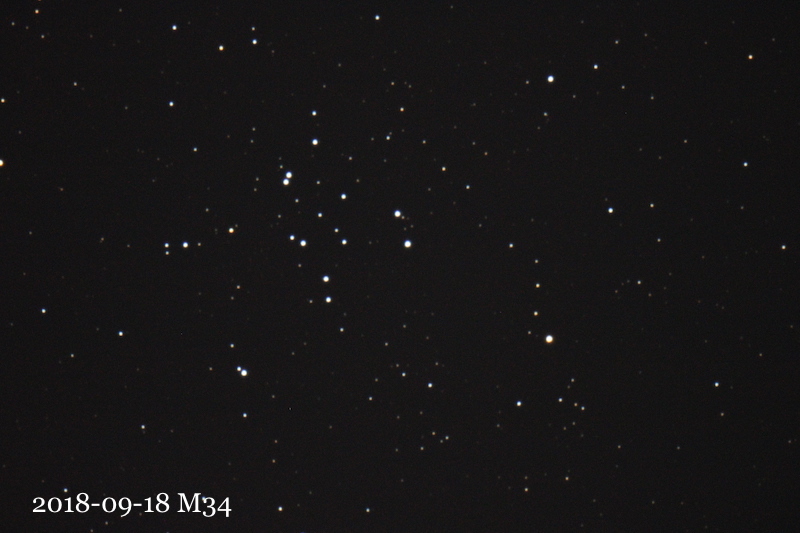 An equally crappy picture taken while I was testing the Evo mount (see M46). 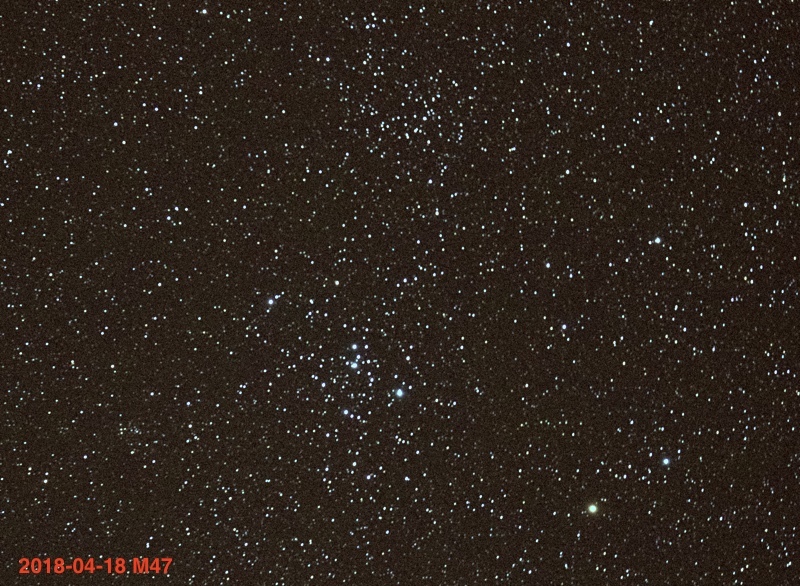 The clump of stars near the top is a separate cluster from M47 and is NGC-2423. 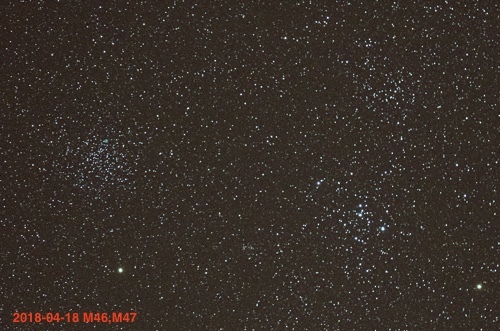 M46, M47 and NGC-2423 are right right next to each other in the sky, but not in real life. Nice. I'll get back to these once I stop playing around. 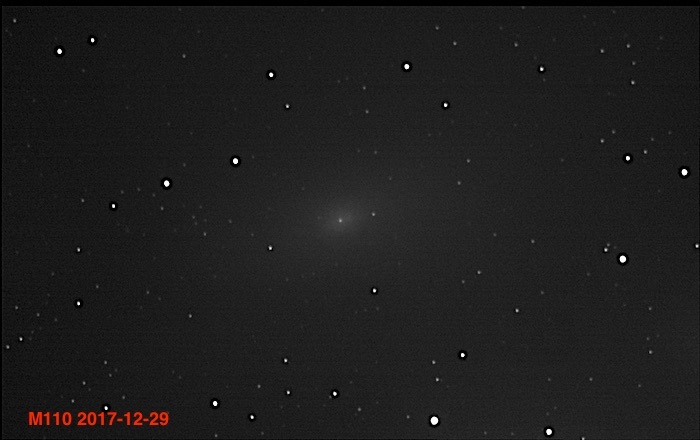 Taken with my C6 (Walter) and a ZWO ASI174MM at prime focus, single 15s exposure. This was the first time using my ASI cameras for anything other than solar work. 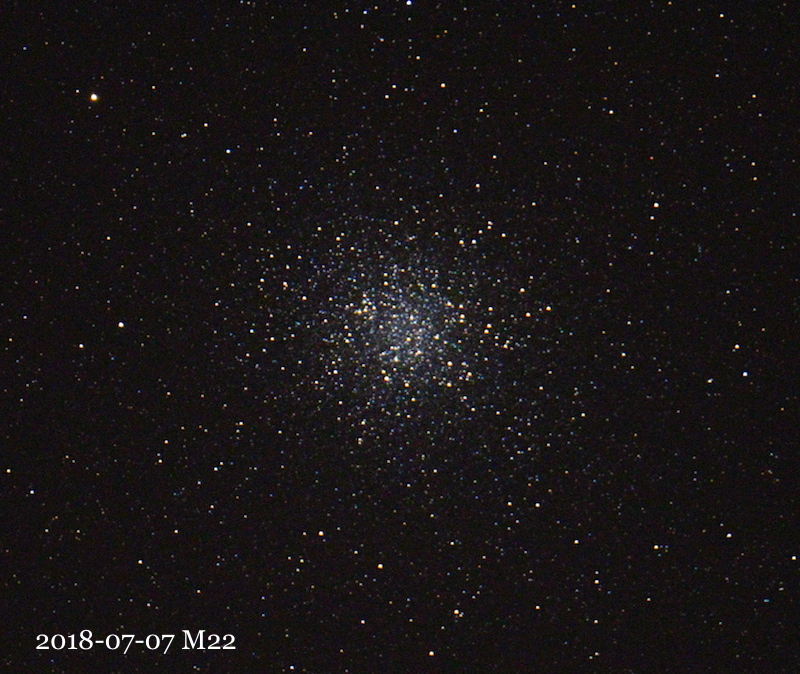 The pointing may be a little off and/or the factory grease in my Losmandy GM-8 mount was starting to get stiff from the temperature being in the 30's F. It became an undeniable problem later in the evening. I later figured out that the scope needed to be collimated a bit too. Tried stacking pictures, but just about every single shot looked better than any combination of stacked pictures. It's hard starting at 1500mm focal length, but there you go. It looks like six hot pixels! Taken with my WOZ61/T6i combo. 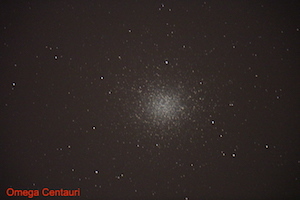 I was testing a Celestron Evolution mount to see if it was good enough for quick-shot photography. While the goal of this picture was to test the mount, and not take a good picture, it didn't turn out terrible. 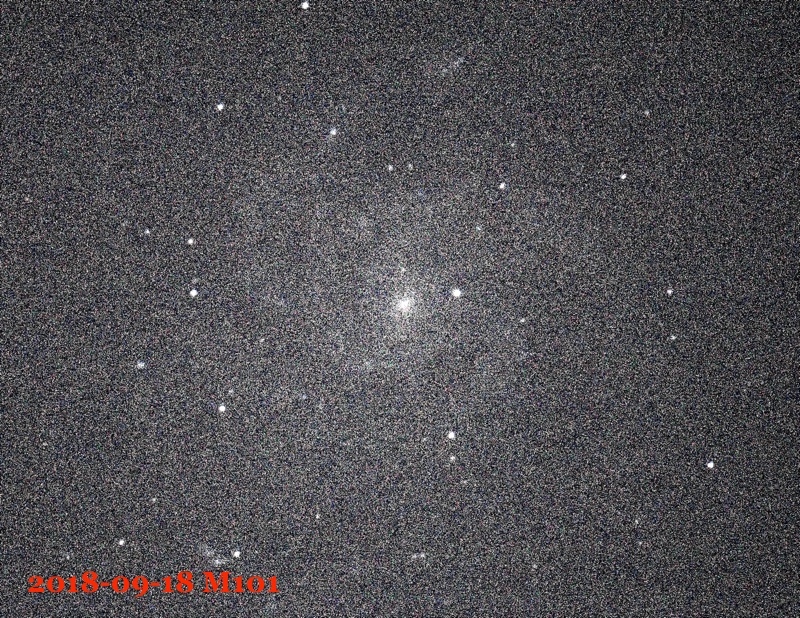 A super bad 30 second picture of M101 with my C8 Edge/T6i on the Mach 1. Just testing. A step up. In June 2018 I went on a road trip to Austin, TX and picked up an Astro-Physics Mach1GTO mount. 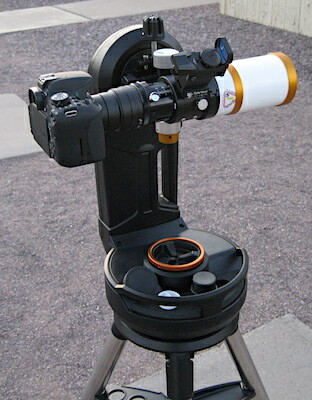 That Celestron EdgeHD 800 (C8) looks a little whimpy on that mount. One of the first pictures with my Mach1GTO mount. C8 Edge and Canon T6i, 30 seconds. Way better than the Evolution mount. 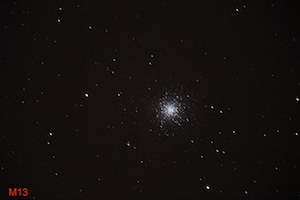 Taken with C6 (Walter) and an ASI174MM camera. No filters or anything. Just black and white. 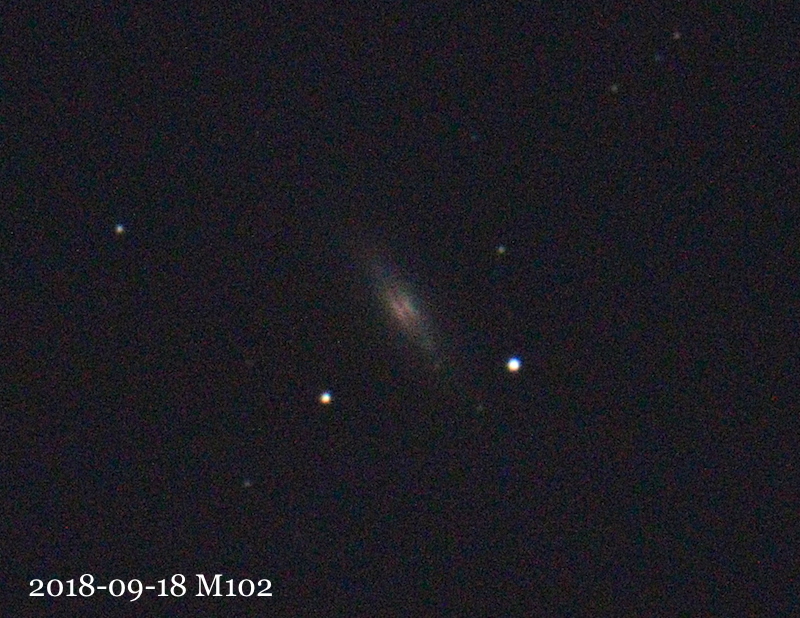 Was on my way from IC-10 to NGC-1049 and stopped to take a quick pic. This is a stack of a few shots, but there were mount tracking troubles. Will need to figure that out. Where in the sky are we?